Should a Firm Buy a Practice Management Suite or Go Best of Breed? Australia is an odd place for practice software. It is one of – if not the only – market where a suite of software from a vendor is the accepted norm. Around the world it is typical to have a best-of-breed set-up. This trend started in the 1980s with Hartley Systems morphing into vendors such as Solution6, CeeData / Xlon to SageHandisoft, CA Systems (now MYOB Accountants Office), MYOB Accountants Enterprise (made up of Viztopia, Sol6 Tax and MAS reincarnated), CCH iFirm (Acclipse) through to APS. All of these suites promised with varying degrees to have a single source of truth. Arguably APS probably did the best job of this. The industry joke is that some products offer a single source of truth – as long as you don’t mind manually updating six databases to achieve this. The problem as I have discussed in previous articles on LinkedIn https://goo.gl/HZecCN https://goo.gl/Gb13Qw https://goo.gl/qPonnw is that no single element in any suite can be best of breed. They all have to have ‘just enough’ functionality to be saleable. APS took the lead with practice management when they launched in Australia in 1999 and it was accepted they for many years had the best PM solution in the market. But in trying to be ‘’all things to all people” APS, like other suites, became bloated and forced compromises onto their clients – manual workarounds in particular. Now we have a best-of-breed approach coming back to the fore with Xero (and QuickBooks Online rapidly imitating). The classic downside of best of breed is that users need to tab through multiple apps and interfaces in the course of their working day. But the modules in suites aren’t necessarily connected – and with cloud software the different apps are essentially just different tabs pinned in the same window. It boils down to convenience and easier maintenance (suite) versus the latest in productivity (best of breed). So which is best for Australian firms? Some background: Over the past 30 years, generations of Australian accountants have learned to overcome limitations in their practice management software. These limitations appear in suite after suite. All of the suites in Australia have fundamentally the same functionality going back to the Hartley Systems because many of the same software developers have moved from vendor to vendor. APS became a better version of MYOB AE which was an improvement on Solution6. But as Peter Thiel noted in his book ‘’Zero to One”, “If you take one typewriter and make 100 – you have made horizontal progress: If you have a typewriter and make a word processor, you have vertical progress”. The legacy vendors are typewriter manufacturers that have only recreated an existing idea. The pace of change has really exposed the suites’ limitations. Most of the suites are administration top-heavy because they frequently added features through acquisition. Some popular solutions STILL are made up of a mix of 16-bit and 32-bit architectures. For you Gen X’s and Millennials, 16-bit is older than ‘old skool’. This causes complications and additional costs to access data stored with these tools. Unfortunately, many firms look for the same suite-style experience with a best-of-breed solution and fail to understand new approaches to practice management. For example, accountants frequently deride Xero’s reporting section because it is light in a direct comparison. But this misses the fact that Xero is aimed at the user not the administrator. The administration of Xero doesn’t require a stack of reports, particularly in the new paradigm of fixed fee/value billing. If you do need more reporting, needless to say there’s an app for that. Another difficulty with suites is that the vendor drives development more than customers. The vendor drives the project in a particular direction and again forces the client to comply with the limitations of the vendor’s product. A vendor led installation is considered ideal for legacy solutions as it is dependant on the consultant’s knowledge which is often not transferable. The risk for firms then becomes that all knowledge resides with one person, either within the firm or the vendor. When a consultant moves on from a vendor or the firm’s administrator quits, why does it feel like one of the walls is collapsing? An administrator-heavy suite leaves the firm at too much risk. Is Xero’s best-of-breed approach unique? No. Is it clever? Absolutely, but they’re not the be-all-and-end-all. They’re just the talk of the town at the moment. Much like Reckon and MYOB tried to do – “get the accounting firm and we’ll sell our products through them’’ – Xero has a clever marketing strategy. When the price of your practice management software is $0 it instantly gives you a lead over quite expensive competitors. Xero services the requirements of both the majority of accounting firms and commercial clients. This may suffice, but arguably vendors such as Karbon and Scoro will do a much better job in the practice management area. The problem for everyone is that it costs next to $0 for accountants to purchase Xero’s practice management software but it costs much more than $0 for Xero to develop. I appreciate that there are some fees in the background, but to maintain the R&D expenditure and ARPU something has to change. Paying $0 for functional software isn’t a problem for accountants but that means Xero’s paid client accounting software will be supporting R&D initiatives and a lot of staff. Practice management is therefore a long term revenue risk from an R&D and support perspective. Xero’s future has to be to increase ARPU (average revenue per user) otherwise the future for its practice management division looks grim. One way Xero could achieve this was foreshadowed at XeroCon last year. Xero’s client accounting software added projects and expenses as paid options. Sure, Xero’s native solutions may not be as good as third-party add-ons, but for many firms they may well be good enough to do the job. Key to this is that Xero captures the revenue not the add-on. If a firm pays even an extra dollar per user per month it will obviously improve their bottom line. But this up-sell approach does come with a catch: I can also see an inexorable move to a suite. it may not occur quickly but projects and expenses on the client side are the tip of the iceberg. In an effort to increase ARPU (the average revenue per user) Xero will add features that ‘get the job done’ – and have monumental benefits to the bottom line. Right now Xero is looking at the many third-party solutions that users are willing to pay $10, $15, $20+ per month – when they get $0. The peril for firms (and add-on vendors) is if Xero acquires some of the more popular solutions in the market aimed at accounting firms. It could then build a suite and make it progressively harder to choose other vendors to connect to the API. So instead of a choice of best of breed, firms will be limited to a select range of add-on partners. I think it would be great for Xero to clarify their objectives so firms that are venturing down the path have long-term clarity. We are still at the thin edge of the wedge here. My concern is that once Xero reaches a critical mass, things will change. There’s no such thing as a free lunch. For the foreseeable future, Xero, Karbon and Scoro are the new mousetrap builders. Do your homework on which is the best for your firm. I can assist if you like. It was just another week in March when the bookkeeper sat down to pay suppliers for the Sydney-based company. However, as the bookkeeper entered payment details for $50,000 worth of invoices, a hacker was lying in wait. The hacker had changed numbers on the invoices and every invoice was paid to dummy accounts. Luckily for the business, the bank was able to reverse the funds transfers, says Tom Cavanagh, a lawyer from Wotton and Kearney who specialises in cyber and data security. Cyber-attacks are rife among Australian SMEs, which faced a blistering 200,000 ransomware attacks in April and May last year, more than any other country in the world apart from Japan. Ransomware, fake invoices and email scams can cost an average of $1.9 million a hit for companies with 100 to 500 employees, according to a recent survey of 600 IT decisionmakers by internet security company Webroot. These are only direct costs and don’t include reputational damage. In February, the Notifiable Data Breach Scheme will force companies to report cyber attacks to their customers and business partners. Security is no longer just the IT department’s problem. Hackers regularly target finance teams for obvious reasons. Every employee is a potential entry point for a hacker to access internal systems. So what’s the answer? This checklist from Murray Goldschmidt, CEO of Sense of Security, and Tom Cavanagh provides helpful hints to protect your internal finance team. Sometimes the simplest checks are best. Your finance team should always ask: “Is there anything suspicious about this email?” Giveaways of phishing emails (fake emails) are spelling mistakes or a missing or incomplete signature. If the sender is not known, always check the email header to see the server domain of the sender. Sender names and email addresses are easily faked. And if unsure, links should not be clicked on. Double-check connection requests on LinkedIn. If the name, occupation and location is not familiar to you, then reconsider whether to accept. It may be flattering to amass a large social following, but this is also a first step to infiltrating your company. When you connect to someone on LinkedIn, they can see your email address by default (this can be switched off). Most software uses the business email address as the username, so a hacker now has half the login details. If an employee is using a password at work they use in their personal accounts, they are very susceptible to a hack. For example, Yahoo reveals that hackers have gained access to most passwords of its three billion accounts. A hacker can search the stolen database, match the name, get the password and with the email address on LinkedIn they can use your account. A first-level LinkedIn connection can also search your contacts for the name of the CFO or other key personnel. Targeted attacks, where fake emails are addressed to targets by name, are called spear-phishing and can be very effective. What is one way to check that the urgent invoice from your CEO asking to pay $100,000 immediately is legit? Pick up the phone and call to confirm. Even if they are travelling. Clever hackers will monitor the CEO’s movements and send money transfer requests just before they board an international flight. A hacker can add “I can’t attend to this because I’m overseas” to give context, which adds legitimacy to the request. It doesn’t take much to confirm with the CEO via a quick text message to their mobile. If it’s a large amount, then make the phone call and get verbal confirmation. It is possible to spoof SMS messages, but nearly impossible to fake a spoken conversation. If you want to take it to Jason Bourne crime fictional levels, add a codeword to prove they are not held under duress. A second pair of eyes on transactions will also increase the chance of spotting a suspicious error. Create a policy for the finance team to call new suppliers before they pay the first invoice. Don’t call the number on the invoice itself: hackers are very enterprising and can pay someone to act as a receptionist. Even if the email address, email signature and logo appear to be genuine, the phone number may be fake. Look it up online and make sure you’re on the correct website. The supplier should be listed in Google Maps or other directories. One way to eliminate fake invoices is to use a third party to authenticate them. Link4 takes invoices from one accounting program such as MYOB and automatically enters the details in a different program such as Xero or QuickBooks Online. The service requires the supplier and the customer to sign up separately. Once connected, the supplier can send invoices directly into the customer’s accounting software. Xero has created an internal network for sending and receiving invoices from two companies on Xero by using a network key to validate the connection. If the finance team knows that all invoices for that supplier appear automatically in Xero, then any invoice from that supplier appearing in an email should automatically be treated as suspicious. Remember when we used cheques? Businesses often required two signatories to withdraw money. The same process should be followed for online banking. Many banks can set up safeguards for two authorisers to approve payments over a certain amount. Newer banks such as Tyro are more sophisticated in permissions. When the finance team makes payments, Tyro automatically notifies the business owner or manager with an alert on their mobile phone. They then swipe to approve each invoice directly. Multi-factor or two-step authentication should be a mandatory policy – definitely on your online banking and accounting software, but also on business software you use regularly. It usually involves sending a time-sensitive SMS code or using an authentication app on your mobile phone. Some banks still use dedicated tokens to provide the second piece of authentication. These little gadgets attach to your keyring and display a randomly generated number to supplement your password. Cloud productivity software is better protected than the desktop equivalent, because it has anti-virus scanning built in. Any email sent through Microsoft Office 365 or Google G Suite is checked to see whether it is carrying malicious code and if it is – it will block access to the attachment. However, companies shouldn’t rely on these default settings. “Standard anti-virus is so useless, it’s as good as having nothing at all,” says Goldschmidt. A phishing email may contain a link which directs the receiver to download a file from a website directly. For a few dollars a month per employee, you can buy security software that will download attachments into a “sandbox”. The software checks the attachment and only gives access if it is free of malware. It is good practice to train your staff to recognise phishing emails and other cyber-security attacks. It is better practice to continuously validate how well they follow the recommendations. One subscription service simulates a phishing campaign by sending one fake email a week to your finance team. The emails look genuine, but if an employee clicks on it, the email displays a message explaining it was against policy to do so or a reminder that these types of emails are dangerous. Free testing services include Trend Micro’s Phish Insights. Paid services include Shearwater’s Phriendly Phishing and Phishingbox. You can find more phishing services here. “There is evidence that the social behaviour of a person in the two to three weeks leading up to their resignation changes dramatically,” says Goldschmidt. The volume of email may increase or decrease, or the frequency of logins to a particular website may alter. That employee could be planning on taking company secrets with them. Another red flag is when a hacker obtains the identity of a legitimate employee and infiltrates the corporate network. Behavioural software flags the activities of the fake employee as suspicious because they are different to the usual pattern. Consider installing apps that analyse employee behaviour. Apps such as Blindspotter, Veriato and Splunk use algorithms to detect changes and altert IT staff. This article was first published in Acuity magazine. The release of Xero HQ’s API for third-party apps is sure to cause problems for Australian software companies selling practice management software. As Xero increases the number of practice-side apps, accountants will have more choice in how they want to run their own practices. The spate of innovation brought about by cloud software has made it virtually impossible for any software company to create a practice management suite that is cutting edge on all fronts. Even Xero, which claims to have spent $1 billion on software development, is still far from achieving this goal. As evidence consider the number of Xero Platinum firms which have bought Karbon, a communications and workflow tool, to work alongside Xero Practice Manager. And yet the latest iteration of Xero HQ will certainly swing market share towards Xero. Firms can now connect one of the most advanced client accounting apps (Xero Blue), a customisable notifications engine (Xero HQ), Australia’s most popular online tax program (Xero Tax), one of three client reporting apps (Fathom, Spotlight Reporting and Futrli), and soon no doubt a CRM (Insightly? Salesforce?). Plus tight integrations with accounts payable apps Receipt Bank and HubDoc and others. The functionality in such a suite will be far greater than anything offered by the incumbents Reckon, MYOB and Sage (HandiSoft). Of course, accountants would need to put up with all the issues of a best-of-breed solution. Namely, multiple user interfaces and a hefty monthly bill from all those subscriptions. It is also true that Xero’s practice suite still needs more work. It is still evident that Xero Workpapers and Xero’s payroll function, both acquisitions, carry the legacy of external code. Xero Practice Manager hasn’t had the investment it needed, giving room for competing apps to establish a toehold. And yet the combined potential of Xero HQ offsets these drawbacks. It’s worth noting that HQ is a way to elevate friendly apps and shut out competing ones. Xero can make one app far more attractive by admitting it to the Xero HQ club. That will make it tough for direct competitors to pick up Xero-focused firms, the number of which grow daily. Xero may still have a way to go in PM but its growing weight is already making an impact. Witness Wolters Kluwer’s decision to make CCH iKnow, the online version of its treasured tax “bible”, available within Xero Tax. This is quite a concession given that CCH sells the only other online tax solution for small and medium practices. The deal signifies a change in the weather between Xero and Wolters Kluwer, owner of CCH Australia. In 2013 Xero CEO Rod Drury reacted to CCH Australia’s acquisition of practice management software iFirm by announcing a similar content deal with Thomson Reuters, though it was never consummated. CCH used iKnow as a weighty carrot to tempt firms to switch to iFirm. Xero is still growing at a rate of knots. It has already racked up 31,000 accountants and bookkeepers in Australia. It has 135,000 partners globally. This makes it a very large market for Wolters Kluwer to ignore. The second reason is that CCH iFirm may not be selling as well as Wolters had wanted. Several firms have mentioned off record that CCH Tax Online is still having teething issues. Xero Tax, on the other hand, has been one of Xero’s fastest growing products. Although Xero bills itself as the home of the small partner or bookkeeper, its software is attracting larger firms than expected, says Matthew Prouse, solutions manager for practice tools. “We have partners using Xero Tax in the mid-tier space. Now they can remove a Reckon or MYOB Tax program and use Xero,” Prouse says. Word on the street is that this is already happening. Reckon APS is losing a steady stream of clients; this year EY was the most notable casualty. CCH at one stage hoped to compete in client accounting software with iBizz, part of the 2013 iFirm acquisition. That plan was quietly dropped. Now that CCH is signalling the priority of revenue from content rather than software, will it walk away from iFirm too? Or will iFirm appear as an app in Xero HQ? “We are building the relationship (between Xero and CCH) but this deal is squarely around iKnow,” Wyner says. I think it’s pretty unlikely in Australia. However, Xero has decided not to push its own practice management tools outside Australia so in some markets it may make sense. The playing field is more level outside Australasia. Xero isn’t making a Workpapers, Tax or Practice Manager for other countries. It will need to stand out from client accounting apps based on the quality of its integration. The notifications engine in Xero HQ is a unique and effective way to do this. Last week Microsoft launched Outlook for iOS, an app that includes Microsoft’s familiar email, calendar, contacts and files. Outlook for iOS is not a simple port of the Windows app – it includes features that leave the default iOS app Mail in the dust. The app works with all major email services (including Outlook.com, Exchange Server, Office 365, Yahoo, Gmail, etc) and is free for personal use. An Office 365 subscription enables commercial use rights for businesses. Microsoft also released Android versions of Microsoft Word, Excel and Powerpoint which can be downloaded from the Google Play store. Microsoft has already released the cornerstone apps of its Office suite on Apple’s iOS platform. The apps include features designed for the respective operating systems and specific to the format of the device, whether smartphones or tablets. Android and iOS users can create, print and perform “core editing” functions in Office documents but can’t use all editing options or save the documents to an online storage service. Subscribers to Microsoft’s cloud productivity suite, Office 365, gain access to full editing features and OneDrive or DropBox storage. Commercial Office 365 subscribers can save their documents to commercial storage (OneDrive for Business, DropBox for Business and SharePoint), use enterprise-grade security, IT management tools like MDM for Office 365 (mobile device management), and commercial use rights. Let’s get back to Outlook for iOS and take a look at what makes it special. Microsoft has addressed a bunch of common issues with mobile email apps that makes old Apple Mail look pretty lame. The Outlook app for iOS separates email into two tabs – Focused and Other. Important emails appear in your Focused inbox. If you move email in or out of your Focused inbox, Outlook remembers in a similar way to Gmail’s tabbed sections. Outlook also has a one-click unsubscribe for newsletters to reduce unwanted mail. Outlook shows a list of recently received email attachments, uses predictive search to find subject lines and senders’ names, and can search across cloud storage and email attachments. A search filter sorts files by type. Outlook has adopted Apple Mail and Gmail for iOS’s swipe gestures – swipe right or left to take actions like archive, delete, move, flag, mark as read/unread or schedule. Unlike other email apps, Outlook lets you personalise these swipe gestures to match your email habits. If you want to process one email later, the ‘Schedule Email’ feature temporarily removes it from your inbox, to return at the time you choose. Send contacts a choice of times selected from your calendar. The calendar in Outlook for iOS looks good, quite similar to Apple Calendar. Outlook for iOS even sends files from Google Drive and Dropbox, as well as Microsoft OneDrive. 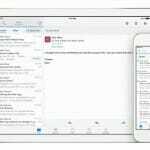 Outlook for iOS interfaces for iPad and iPhone. The bigger news is that Outlook for iOS users can attach files from cloud storage – and not just Microsoft’s own OneDrive. You can send from competitors such as Dropbox and even Google Drive. This is truly a post-Ballmer product. Microsoft has also done an excellent job at integrating the Outlook calendar with the iOS operating system. 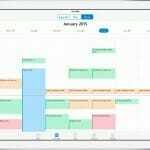 In Outlook, calendars are available right within the app, allowing direct interaction with email, including features like viewing meeting details, invitees and their attendance status. The ‘Quick RSVP’ feature lets you respond to meetings (Accept/Tentative/Decline) right from your inbox, without even opening the mail. The ‘Send Availability’ feature lets you find and share available meeting times in email . Once you’ve settled on a time, you can even create a meeting invitation – all handled without leaving the app. Outlook for iOS and the upcoming app for Android will replace the OWA (Outlook Web App) for iPhone, iPad and Android apps. Businesses who want features such as information rights management should continue to use the OWA for Devices app on phones and tablets for the near term. These advanced features will be coming to Outlook on iOS and Android in the coming months. Here is the Microsoft post announcing the Outlook for iOS release. The company has put together an FAQ, pasted below. Microsoft announced it would release a new program, Skype for Business, an enterprise-grade communications tool which would be available early next year. Skype for Business will replace Lync, the audio, video and chat communication tool within Microsoft’s cloud productivity suite, Office 365. Skype for Business will include similar features such as enterprise security, compliance and control. Skype for Business is both a rebrand and a new product, with Microsoft releasing a new client experience for mobile, tablets and desktops, new server release, and updates to the service in Office 365 under the Skype for Business name, a spokesman told Digital First. “In the first half of 2015, the next version of Lync will become Skype for Business with a new client experience, new server release, and updates to the service in Office 365. We believe that Skype for Business will again transform the way people communicate by giving organizations reach to hundreds of millions of Skype users outside the walls of their business,” says Gurdeep Pall, Skype corporate vice president, in the company blog. Skype for Business incorporates familiar and intuitive elements from both Skype and Lync, with recognisable Skype icons as well as the content sharing and telephony capabilities of Lync. Skype for Business also adds video calling and the Skype user directory making it possible to call any Skype user on any device. Skype for Business is the newest version of Lync, which will still exist in previous versions such as Lync 2013, etc., Microsoft says. Lync users can gain access by updating from Lync Server 2013 to the new Skype for Business Server in their data centres, with no new hardware required. For Office 365 customers, the Skype update will occur automatically. Microsoft will help Lync 2013 customers quickly adopt Skype for Business by enabling video connectivity between Lync 2013 users and the Skype network by the end of 2014. It will provide administrators with the option to use either the new Skype for Business UI or the existing Lync UI with the Lync 2013 client. This allows them to take advantage of the familiar Skype interface immediately once Microsoft releases the new client. Lync Server 2013 customers will be able to migrate easily to Skype for Business Server because Microsoft use the same hardware profiles and provides easy to follow steps for upgrading server software, Microsoft says. There are no changes for Lync 2010 customers. More details such as call costs, integration of Skype credit and PBX functionality would be released at a later date, Microsoft told Digital First.